Average credit card rates offered to consumers, small-business owners and students for new accounts remain at stubbornly high levels, according to the latest survey by IndexCreditCards.com. The average rate offered to consumers for both reward credit cards and non-reward credit cards hit 16.86 percent in early December, a record high since IndexCreditCards.com began tracking rates in 2005, and has stayed there ever since. Today's rate is more than a half percentage point above the year-ago average of 16.28 percent. Credit card issuers began ratcheting up rates in 2009 after Congress passed the Credit Card Accountability Responsibility and Disclosure Act, signed into law in May that year. Among other things the law prohibited credit card companies from raising rates on new purchases during the first year of an account or on existing balances at any time unless card holders were 60 days or more late on payments. The law also required cosigners on credit card accounts for college students under 21, and it banned issuers from marketing on campus and giving away free merchandise to students for filling out credit card applications. The law's most substantive provisions went into effect in February 2010. In the preceding months, issuers raised rates offered on new accounts to offset impacts of the new regulations. The average credit card rate offered consumers in August 2009, for instance, was 14.99 percent. By March 2010, the average consumer rate had risen to 16.8 percent. Since then, the consumer credit card rate has bounced up and down slightly, from a low of 16.74 percent in November to today's high. As usual, the average reward credit card rate, now 17.55 percent, is higher than the average non-reward credit card rate of 15.25 percent for consumers. Reward credit cards typically carry higher rates, which help pay for the cash-back and other bonuses for using the cards. Student credit card rates have risen more slowly in the last year, increasing to today's average of 16.21 percent from the January 2010 level of 16 percent. But rates for business credit cards, which are exempt from the Credit CARD Act provisions, have risen faster than other categories. The average rate for non-reward business credit cards is 14.72, versus 13.39 percent a year ago, and the average rate for reward business credit cards is 16.21 percent, versus 14.53 percent in January 2010. Many of the credit card offers included in the survey feature introductory rates as low as zero percent to encourage card holders to transfer balances from other credit cards. IndexCreditCards.com does not include the low teaser rates in the survey, counting instead only the regular interest rates that go into effect after the promotional periods end. Most of the credit cards included in the survey offer variable rates, which include an index, such as the prime rate, added to a margin set by the credit card company. Even if the credit card company does not change the margin, rates can go up if the index rises, which is probable, given that the prime rate is at a historically low level. IndexCreditCards.com takes into account all the regular rates on purchases for each of the credit cards in the survey. 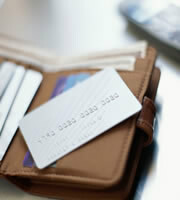 Many credit card offers feature two to four different rates, based on the credit worthiness of applicants. Those with the best credit ratings get offered the lowest rates, while those with poor credit are offered the highest rates. 0 Responses to "Credit Card Rates: Consumer rates stay perched at the peak"